3 Quarks Daily has just announced the winners in their 2010 Prize for science blogging, judged by Richard Dawkins. Congratulations to all the nominees, and especially to the finalists and winners. I think 3QD is doing a great thing by drawing attention to the high quality of writing that can be found on blogs: it’s still too common to hear people being dismissive of the form, rather than attentive to the content. The challenge, of course, is filtering through the overwhelming number and variety of sites, something that events such as these 3QD competitions can really help with. It’s a remarkable thing that so many people write so well and so passionately about so many subjects and share their work so freely. I submitted my post on Daniel Mendelsohn’s The Lost to the 3QD Arts and Literature competition earlier this year because, as I said at the time, “the book absolutely topped my list of notable reads last year, because writing about it as well as I could was important to me, and because I was reasonably satisfied that I had said what I wanted to about it. Also, one of my most trusted readers wrote me to say that she thought it was the best thing I’d ever written on my blog.” I’m proud that my post was selected as a finalist. 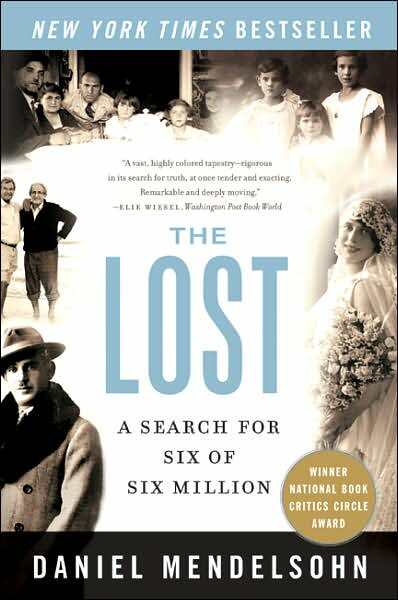 “So many people know these horrible stories by now,” Daniel Mendelsohn reflects near the end of The Lost: A Search for Six of Six Million; “what more was there to say? How to tell them?” The Lost itself is, of course, his answer. This extraordinary book, at its simplest level, is a more or less chronological account of Mendelsohn’s quest to learn the fate of his great-uncle Schmiel (Sam) Jager, his wife Ester, and their four daughters, Lorka (b. 1920), Frydka (b. 1922), Ruchele (b. 1925), and Bronia (b. 1929?). From early in his childhood Mendelsohn knows where his relatives lived, in the Polish town of Bolechow, and he knows that they died during the Holocaust, but beyond this he has only fragments of information, from stories half-heard or half-understood (“Once, I overheard my grandfather saying to my mother, I know only they were hiding in a kessle. Since I knew by then how to make adjustments for his accent, when I heard him say this I simply wondered, What castle?”), from photographs (“killed by the Nazis,” his grandfather has written on the back of a photograph of Schmiel in his WWI uniform, brought by Daniel to school for a presentation to his Grade 10 history class: “I remembered what had been written because I so clearly remembered the reaction to those words of my high school history teacher, who when she read what my gradnfather had written clapped a hand to her handsome, humorous face, . . . and exclaimed, ‘Oh, no! '”), from letters (“The date of Onkel Schmil and his family when they died nobody can say me, 1942 the Germans kild the aunt Ester with 2 daughters,” writes his Great-Aunt Miriam from Israel in 1975). Only once he makes it his mission to fill in the gaps in his knowledge does Daniel realize, over the course of many years and many interviews with surviving “Bolechowers,” in America and Australia, Israel and Denmark and Poland, that he “knew” almost nothing. Indeed, The Lost is in large part a meditation on what nobody knows, what nobody can know: not just the facts, what happened to Schmiel and Ester and their daughters (“such darling four children,” Schmiel writes in 1939, in one of his desperately dignified letters to his American relatives, asking for money and help to get his family “away from this Gehenim,” this Hell), the facts of their deaths, but also their lives. Who were they, these six people, now almost as lost (as Mendelsohn ruminates near the volume’s close) as the many millions who, before them, lived and were lost into what is now history? What can we really know of them, or say about them? For everything, in time, gets lost: the lives of people now remote, the tantalizing yet ultimately vanished and largely unknowable lives of virtually all of the Greeks and Romans and Ottomans and Malays and Goths and Bengals and Sudanese who ever lived, the peoples of Ur and Kush, the lives of the Hittites and Philistines that will never be known, the lives of people more recent than that, the African slaves and the slave traders, the Boers and the Belgians, those who were slaughtered and those who died in bed, the Polish counts and Jewish shopkeepers, the blond hair and eyebrows and small white teeth that someone once loved or desired of this or that boy or girl or man or woman who was one of the five million (or six or seven) Ukrainians starved to death by Stalin, and indeed the intangible things beyond the hair and teeth and brows, the smiles and frustrations and laughter and terror and loves and hunger of every one of those millions of Ukrainians, just as the hair of a Jewish girl or boy or man or woman that someone once loved, and the teeth and the brows, the smiles and frustrations and laughter and terror of the six million Jews killed in the Holocaust are now lost, or will soon be lost, because no number of books, however great, could ever document them all, even if they were to be written, which they won’t and can’t be; all that will be lost, too . . . everything will be lost, eventually, as surely as most of what made up the lives of the Egyptians and Incas and Hittites has been lost. But for a little while some of that can be rescued, if only, faced with the vastness of all that there is and all that there ever was, somebody makes the decision to look back. . . .
And of course that is what Mendelsohn himself has done, to look back, to see “not only what was lost but what there is still to be found.” Though his initial interest is in just how his lost relatives died (“we did end up finding out what happened to Uncle Schmiel and his family–by accident,” he tells us early on), his preoccupation becomes something at once more expansive and more elusive: their lives, their experiences, their identities–what they lost, in becoming no longer “themselves, specific” (“I was reminded the more forcefully,” he says at a crucial moment of discovery, “that they had been specific people with specific deaths . . . they were once, themselves, specific, the subjects of their own lives and deaths”) but only six of six million, lost in the sheer magnitude of the loss of which their own deaths were specific only to them. Mendelsohn’s refusal to take over their specificity, to presume to know them or speak for them, for me was one of the most impressive features of the book. Even when he reconstructs likely scenarios, he frames them with a respectful uncertainty. How presumptuous, after all, to think we can stand, vicariously, in the place of his sixteen-year-old cousin Ruchele, killed in Bolechow’s first official Aktion. “I have often tried to imagine what might have happened to her,” Mendelsohn remarks, “although every time I do, I realize how limited my resources are.” Not only is the evidence fragmentary and unreliable, not only can “memory itself . . . play tricks,” but “there is no way to reconstruct what she herself went through.” Still, he tries, drawing on his own interviews with survivors and witnesses but also from documents in Yad Vashem, but never presuming to know what was really only Ruchele’s knowledge (“It is indeed possible that,” “if she survived those thirty-six hours,” “with what thoughts it is impossible to know,” “Did she hear it? . . . We cannot know.”) “That is the last we see of her,” he says at the end of this section; “although we have, of course, not really seen her at all.” The sense of loss at this point is acute: the waste, the horror, the mystery, the finality of death. I can tell you, he began, that Ruchele perished on the twenty-ninth of October 1941. I was startled, and immediately afterward moved, by the specificity of this memory. I said, Now let me just ask you, why–because you remember the date so specifically–why do you remember the date? As I wrote down Ruchele–>Oct 29 1941, I thought to myself, He must have really loved her. Jack said, Because my mother and older brother perished on the same day. I said nothing. We are each of us, I realized, myopic; always at the center of our own stories. As I looked I suddenly felt foolish for asking Mrs Begley to look in her book [of the victims] for my relatives, whom I never knew and who meant something rather abstract for me at that point, when so many of hers, so much closer to her, were there too. . . .
Then she took a breath that was also a sigh, and started telling me her own stories of slyness and survival, and other stories, too. Of, for instance, how, successfully hidden herself, she had bribed someone to bring her parents and in-laws to a certain place from which she would take them to safety, . . . and how when she arrived at this rendezvous she saw a wagon filled with dead bodies passing by, and on top of the pile of bodies were those of the elderly people she had come to rescue. . . .
And then she added this: Because she herself was in danger, was “passing” at that point, she couldn’t allow herself to betray any emotion when she saw the bodies of her family passing by in the wagon. . . .